The Lowepro Pro Runner 300 AW backpack is lean, mean, and comfortable. This beauty can accommodate a standard DSLR with 70-200mm f/2.8 zoom attached, plus spare lenses, flashes, and even personal gear in its roomy front pocket. It includes: side compression straps with quick-release buckles; a Hideaway Tripod Mount system; rainflap lids; SlipLock™ attachment loops; mesh side pockets; discreet front pocket accommodates a light jacket, cell phone or MP3 player; memory card pockets on inside lid; padded mesh backpad; adjustable and padded shoulder straps; webbing grab handle. And it might be yours. For your chance to win the Pro Runner 300 AW, post a comment below answering the question: “Are your urban or outdoors?” Since this backpack works great in both environments, either is appropriate. We’ll randomly select a comment next week, and notify everyone on our Facebook Fan Page and here. Deadline to comment is midnight PDT, Sunday May 6, 2012. Contest is void where prohibited. One winner will be selected and receive a Pro Runner 300 AW. I’m an outdoor enthusiast that does mostly forests, farms, waterfalls and covered bridges in the northeastern United States. 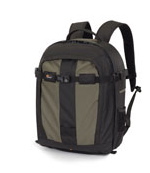 I’m currently using a Lowepro 150AW but I’ve already outgrown it. I hate to leave equipment in the car or at home!! I prefer rural settings, but I live in the centre of a city, so dabble in both! Natural sunlight is my favourite! Mainly urban but slowly making the move outdoors as I’m finding my feet with outdoor lighting. Defintely outdoors! Just got back from an amazing trip to Petra with my trustee Pro Runner 250. My lil’ LowePro backpack hiked with me, all the way up to the Monastery, rode on camel back & a mule through Petra, flew back to Dubai then off to the tropical jungles of Sri Lanka! I love LowePro <3 ! Urban since I like to photograph my people. Outdoors is the place to be with a new Pro Runner 300 AW backpack. I am definitely outdoor. Actually, can you make a bag that is for outdoor and as solid as Flipside 300? Would love to get one for my biking trip. With Pro Runner 300 AW, I am convinced I can be both! Both. As long as I have a camera in my hand and my gear strapped to my back, I don’t care where I am, I’m happy! There is more to photograph in urban environments, and it is pretty much guaranteed that I will come up with some interesting images. That said, I feel more “in my element” in outdoor rural settings. The vast majority of my photos are taken outdoors, either in urban or rural environments, so “outdoors” can apply to either in my book.